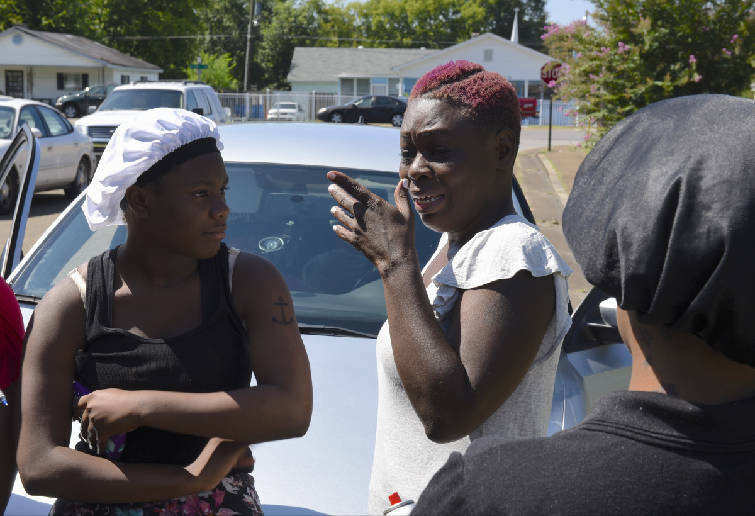 Hours after 20-year-old Jordan Clark was gunned down on an East Chattanooga street, his mother, sisters, cousins and friends huddled near the bullet-ridden fence where he died. Satedra Smith, center, cries as she talks about her son, 20-year-old Frederick Jordan Clark, on Wednesday, Aug. 26, 2015, in Chattanooga, Tenn., in the aftermath of a Tuesday night shooting in the 800 block of North Willow Street that killed him. Clark's sister, Asia Smith, left, and cousin, Marquita Robinson stand with her on Willow Street at the scene of the shooting. They hung balloons. Spray-painted his name on the sidewalk in dark blue paint. Set up candles. And his mother, Satedra Smith, fought the anonymity of her son's death. "His life mattered to me," she said, trying to hold back tears. "It mattered to his sisters and brothers. His life mattered." Police say Clark, a Rollin 40s Crip, was shot and killed by a member of rival gang Rollin 20 Bloods in a drive-by attack Tuesday night, part of a dispute that's been going on for days, perhaps weeks. Clark was walking with another man, Tavoris McKeldin, on North Willow Street when a white PT Cruiser rolled up, and someone started shooting, police said. McKeldin ran, climbed a fence and escaped without injury. Clark went down. Another man, Vernadus Adair, 37, was hit in the leg as he sat on his porch, but survived. Clark, an outgoing man, always made sure his sisters had what they needed. He'd walk around shirtless, loved dogs, and would never let family members leave without saying they loved him. In 2013, he was charged with aggravated burglary, vandalism and theft — a case that was still pending in Hamilton County Criminal Court when he died. The PT Cruiser sped away from the scene after the shooting, and an anonymous caller alerted police to its location as the car darted in and out of traffic, headed toward Brainerd. Investigators traced the car to a woman, whom they said told them her boyfriend had been driving it during the shooting. Police arrested that man, 20-year-old Christopher Walton, and charged him with first-degree murder, three counts of aggravated assault and reckless endangerment. Walton is being held on a $1.3 million bond. When interviewed by police, Walton smelled like bleach, the investigator noted. He told police he'd been doing laundry, but couldn't explain why witnesses described him as the driver of the PT Cruiser used in the shooting. Hours after the attack, police began a Violence Reduction Initiative enforcement action against the gang and group members involved, Police Chief Fred Fletcher said Wednesday. The initiative, launched in March 2014, aims to reduce gang-related gun violence by offering offenders who want help a way out while also coming down hard on offenders who keep shooting. "We are sick and tired of this street violence," Fletcher said. "It is too much. This community won't accept it anymore." The ongoing gang fight that prompted Tuesday's killing also has been responsible for multiple recent shootings, police said. Fletcher declined to say exactly how many, but said Tuesday's attack could be related to the 14-year-old who was shot four times on Sunday. That boy survived. Police aren't sure what started the overarching fight. "Often in these cases, there is more than one beef, and just like any argument between people, sometimes it is hard even for the people involved to trace back what the source of the beef was," he said. "Whatever it is, it is not important enough to threaten the safety of our community." He said police found "substantial additional evidence" beyond the PT Cruiser that linked Walton as the gunman. He did not say what that evidence included. In the last two months, the Hamilton County District Attorney's Office has dismissed three homicide cases against three separate defendants because of a lack of evidence or witnesses. Fletcher said police worked closely with District Attorney General Neal Pinkston to ensure investigators collected enough evidence to sustain a criminal case this time. "I told General Pinkston, you let me know what you need to make sure this is taken seriously," Fletcher said. "I'll show up in court myself. You've seen me do it." Clark is the 64th black man to be shot in Chattanooga so far this year, and the eighth to be killed. Eighteen people have been murdered so far this year, including the five U.S. service members killed in a July 16 attack. Smith, planning her son's funeral, vowed to do more to stop the daily, senseless violence she sees in Atlanta and Chattanooga. She hopes to try to keep another mother from feeling the pain she feels. As she hugged her daughter beside the memorial to her dead son, she promised to never, never forget him. "I'm here looking at my son's name on that ground," Smith said. "Looking at the bullets that shot my baby. Who is going to speak for him? He can't speak for himself anymore."